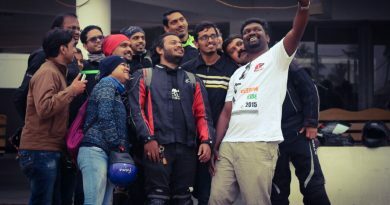 The starting point was ITI gate bus stop near KR Puram and I was very excited to meet all the Road Thrill members and ride along with them and here goes our 1st groupfie for the day. After small brief introduction about the ride which was given by JP bhai, Lohith Bhai, & Anirban Bhai and post which we started our much awaited “Temple Run Ride” to Kurudumale and Avani. The sun was just rising for the day and we stopped for a couple of photo sessions at Kolar Highway. We all love to take pics, but a pic with our biking brothers will always add to the glamour and beauty of the ride. Here comes a pic of my “Warrior” along with other bikes and the beautiful sunrise. 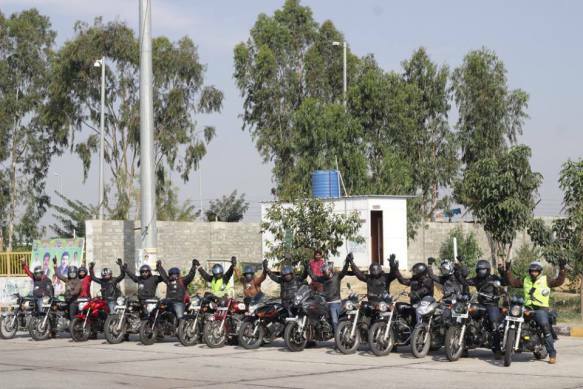 We at Road Thrill always ride together in group formations. Road Thrill Members riding in a single Lane Formation. We checked in to Hotel Vasudev Adigas near Venkatapura – Vadagur enroute the Kolar Highway for breakfast. Adigas has always been a common breakfast point chosen by most of the travellers on Kolar highway. A pretty creative names given to dishes with a touch of names of few famous celebrities. A very good and decent hotel to have some delicious breakfast with family and friends. As said earlier, this is a common breakfast point chosen and on weekends, especially on sundays you may sight a couple of super cars or bikes or biking groups. Jacinth Paul (JP Bhai), Lohith, Shekar, Udayshankar Nayak, Akmal Khan, Bharat M, Sanjay, Bharat R, Anirban, Prashanth, Kiran, Dony, Rajesh, Panindra, Mezen and I, Gokool Kini. After breakfast we continued our journey to Kurudumale and Avani. We stopped at Mulbagal Toll Naka to take some pics of all our riders posing with our bikes. Kurudumale is approximately 6kms from this toll naka, you have to take a deviation to your left from the Kolar highway and keep riding till Kurudumale which has a very famous Ganesha temple wherein the height of the Ganesha statue is 14 feet tall. 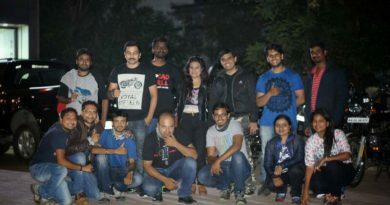 We had a small introduction session of all the riders followed by JP bhai speaking about Road Thrill and upcoming events happening under the banner of Road Thrill. After visiting the famous Ganesha temple of Kurudumale, we started riding to Avani. We reached Avani and to our surprise, there was a temple fair happening at the temple on account of MahaShivratri festival followed by a long weekend and hence was fully crowded by travellers and pilgrims. It was our fellow rider, Kiran’s birthday and JP Bhai got a cake from the nearby bakery and Kiran’s birthday was celebrated at Avani. My “Warrior” with a couple of helmets on it. Wowwwww ! ! ! ! Our very next destination was the very famous “Kotilingeshwara Temple” and we took the village roads to reach this temple. As told earlier that we were riding just after MahaShivratri which was followed by a long weekend and crowd was expected here as well. “Kotilingeshwara” as the name suggests has over a crore of Shivalings present here. We visited the Kotilingeshwara temple in the afternoon under scorching sun. If you have plans to visit this place, please make sure you visit early mornings or after the peak sun hour. My Selfie in front of 108 feet tall Shivaling and a 30 feet tall statue of Nandi. Also few lakhs of small Shivling at Kotolingeshwara. 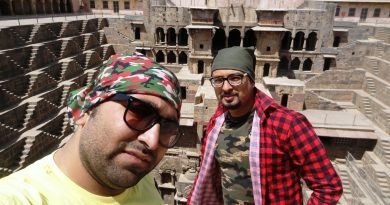 We had an awesome time spent here at the temple looking at those lakhs of shivlings and capturing pictures along. The pics you take are the only proof of your travel and you will have a beautifull collection of your memories in the form of photographs. Here after exiting from the temple, we hit straight to Kolar Highway and stopped for lunch at “Roti Ghar” which is just 2kms from the highway junction / bridge. We had good discussions with everybody, speaking and listening to some interesting travel stories, got to know each other while having our lunch. Post lunch we started our journey back to Bangalore and reached Hoskote Toll naka to Bid Adieu and thanked every one who made it successfully for yet another travel memory to be cherished in our life. A special thanks to Jacinth Paul (JP Bhai) and Road Thrill Community: Meet, Travel Discover for creating a platform where people get to “Meet” new people who go on to become a part of Biking Brotherhood family, “Travel” and explore to as many places together as a group and where people get to “Discover” hidden talents of Building personal networks, Photography, Blogging, Videography and lots more. Thanks a lot everyone. Photo Credits to JP Bhai, Lohith Bhai and Mezen. P.S. Please spare me for any grammatical mistakes. Like Road Thrill’s Facebook page here to stay updated of our calender events.